A recent Central Pollution Control Board (CPCB) report has found that groundwater of villages near Vadodara, known as Gujarat’s cultural capital, is highly polluted due to “industrial activity”, mainly because of what it calls “unscientific disposal of hazardous waste water” into the effluent treatment channel. The report, which is based on a study of samples taken in several villages near Vadodara, says that the colour of the groundwater all over varies from dark brownish-red to pale yellow, adding, the situation is particularly extremely alarming in groundwater locations around the dye intermediate industries. Prepared in September 2016, the CPCB, which is a Government of India statutory body responsible for monitoring pollution, decided to carry out the monitoring job on receiving a complaint from the Farmers’ Action Group (FAG), a local people’s organization, about groundwater pollution in two talukas of Vadodara district, Padra and Jambusar. The CPCB examined groundwater pollution around Luna and Dudhawada villages of Padra taluka, and Piludara village of Jambusar taluka. Carried out in two phases, its team collected in all 19 groundwater samples from borewells. Senior environmentalist Rohit Prajapati of Paryavaran Suraksha Samiti and a few farmer activists from FAG also accompanied the CPCB team for taking samples. Providing details, the report says, during the first phase, the highest concentration of colour, up to 1,350 Hazen units, was reported inside the premises of chemical and textile dye industries, followed by areas surrounding the industries (1,200 Hazen units). 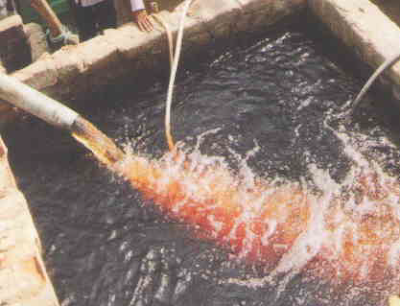 Finding high concentration of colour in all ten locations, ranging from orange red to yellow, the report says, COD and TDS monitored in ten borewell water samples has varied from 30 to 737 mg/l and 1,461 to 5,199 mg/l, respectively. 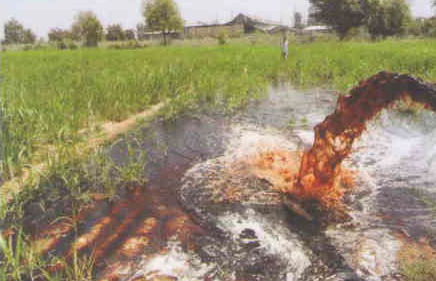 In the second phase, in which groundwater monitoring was carried out on nine locations next to the effluent channel, which takes treated waste water to be disposed of into the sea, found a very high concentration of groundwater pollution of up to a whopping 6,000 Hazen units – with groundwater becoming dark orange red in colour in the worst scenario. Its COD level was found to be 328 mg/l and TDS at 5,819 mg/l. In fact, the report said, the physical appearance of groundwater samples in as many as eight of the nine locations in phase two was found to be ranging from dark brownish red to pale yellow. Only on one location, the groundwater was found to be of having lesser concentration of pollution, and was therefore being used for drinking and domestic purposes. The report observes that the samples collected from areas near the effluent channel revealed that there was “significant increase” in concentration of pollutants as compared to the monitoring results of samples collected at upstream. It notes, it is evident from the monitoring results that there must be slug discharge of partially/untreated effluent into the channel from several of the industries. The report concludes that, prima facie, it appears that there is high concentration of groundwater pollution in the area because of unscientific disposal of hazardous waste, insisting, the problem of groundwater contamination is growing in the region. It believes, groundwater may be contaminated due to illegal activities by dye Intermediary units located in the area, pointing towards “strong resentment” among the farmers who depend on groundwater for irrigation. Based on the study, the report recommends urgent need to carry out study of the extent of groundwater contamination, identification of sources and locations in areas of mixed waste streams from multiple industries by engaging agency/consultancy/laboratory of national repute across India.